After converting point data to a segmented mesh model, you can select and classify groups of objects within Pointfuse. Do this to isolate features, such as walls, floors, pipework or steel frames. When exported using the industry standard IFC or FBX formats, the intelligent mesh model maintains this classification, making it easily recognisable within BIM 360 and Autodesk® Navisworks®. The benefit is that only those objects that are most relevant will be uploaded and shared, eliminating unnecessary data transfer and making production of the final model significantly quicker and easier. Using Pointfuse, you can achieve accurate, highly detailed models, in useful data formats, that are ready to use in just a few hours. You can then upload them to BIM 360 or export to files on your PC, as DAE, DXF, FBX, IFC, NWC, OBJ, SKP, STL or X3D. 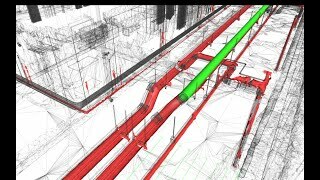 Pointfuse models can be uploaded directly to BIM 360, providing an easy route for as-built data to enter the collaborative environment. Reality models have a significantly smaller file size than point clouds, so upload speed and bandwidth requirements are less. From BIM 360, the models can be easily accessed by all parties, either on a desktop or by mobile, meaning reality models are now available to anyone at any time. The ability to classify objects within Pointfuse, both automatically and manually, has had a huge impact on how as-built data is used within the construction workflow. Being able to quickly compare specific as-built objects and designs without having to run clash detection on a full model or point cloud, saves both processing time and human hours, reducing the number of false and irrelevant clashes. One of the key benefits of digital construction techniques is the ability to add 4th-dimensional information to elements within a model. This extra level of detail contains information about lead-in, construction and operational times, the sequence in which components should be installed, as well as dependencies across the whole project. As-built data can be combined with Autodesk® Revit® design models for every stage of the construction process so that a change analysis can be performed, and progress can be accurately monitored. Regions where construction has fallen behind schedule, can then be easily identified. This information can be sent to planners so that updates to the schedule can be implemented in real time and projects can to run smoothly. In addition to providing information for the construction planners, these regular as-built models can be used for verification and audits, by providing a geometrically accurate snapshot of every stage of the construction process. Effective scheduling means that as elements are installed, an as-built model is produced, so construction can be precisely reported. Crucially, this means that any errors or alterations can be identified and rectified early on - before construction has moved on beyond the point of easy repair. Automatic classification of planar surfaces.